I love SWAPS! What’s not to love? They are cute tiny handmade items with safety pins for trading. The only problem with making SWAPS is the time needed to make them. Since I made almost 200 SWAPS for camp I needed easy SWAPS that were also inexpensive to make. 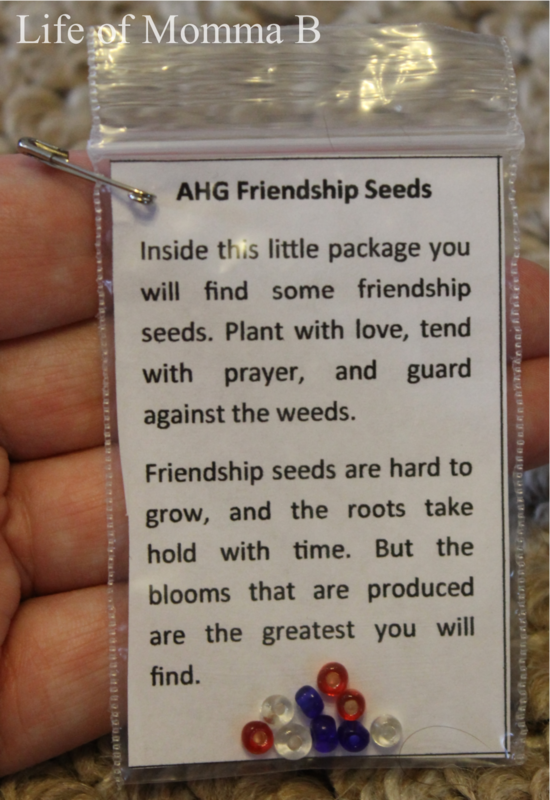 So after scouring the internet I decided that I would make AHG Friendship Seeds. There are many different “Friendship Seeds” floating around the internet, but none seemed just right. So, with the help of my very talented husband we created the text. The words were printed on paper and placed in a 2×3 zipper bag with a few seed beads. Nothing could be quicker! This entry was posted in American Heritage Girls, Crafts and tagged AHG, beads, printable, SWAPS. Bookmark the permalink.